The village rugs are the second category hand weaved carpets (Nomadic, Village, Workshop). The village rugs tend to have a stronger color palette and more variation in the design than the nomadic rugs. They are almost all in geometric format. Whereas in tribal rugs, the colors are more muted and designs more constrained, in village rugs the colors can be much brighter and designers freer. In addition, each village would have its own specific color palette and designs that go back generations. In fact, this is one way to distinguish the rugs from various villages in a region. The villages in the Caucasus region including the countries of Armenia, Azerbaijan, Georgia, and Dagestan produce some of the most vivid design and colors in the village rugs. The village rugs tend to be smaller in size since they are weaved on a small loom which must fit the small rooms in the villages and the weavers are mostly women. 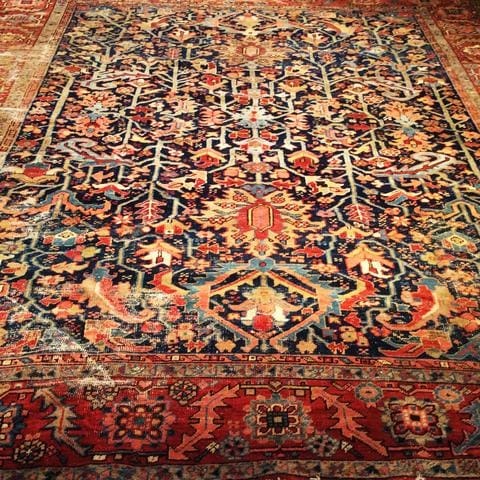 Other regions in Asia with beautiful village rugs include the North-West Persia. The villages of Sarab and Bakhshaish in the Azerbaijan district of NW Persia and Kurdistan in Western Persia have produced some of the most beautiful village rugs in the world Finally, villages in Eastern Turkey make their own regional design of small carpets and kilims that have beautiful colors and distinct designs.